Variety is apparent again from the Perth Mint of Australia with new collector coins released for May. 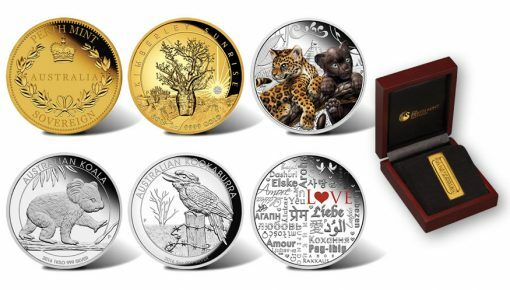 Subjects covered by the debuting strikes include a new gold proof Sovereign, two high relief kookaburra silver coins, a one kilo koala silver coin, and a colorful jaguar silver coin. Also newly introduced are products related to the popular Star Trek entertainment franchise. This includes the Deep Space Nine Gold-Pressed Latinum Slip 1 oz Silver Gold-Plated Bar, a Spock Stamp & Coin Cover and a U.S.S. Enterprise NCC-1701 Stamp & Coin Cover. 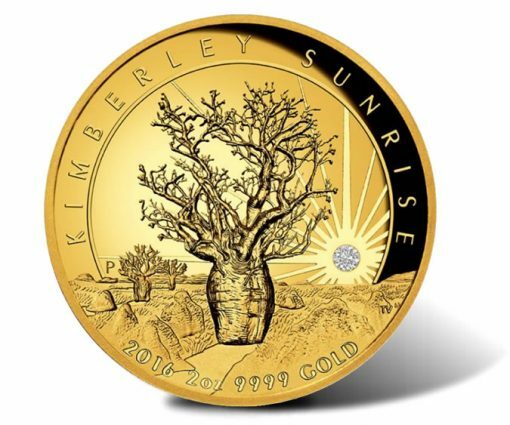 In addition, the Perth Mint also unveils its second Kimberley Sunrise gold coin offered as a companion to its popular 2015 Kimberley coin. Australia’s gold coining history is represented with this new gold sovereign. A recreation of the original Type I sovereign with its unique colonial design, this collectible proof coin honors the establishment of the Sydney branch of the Royal Mint in 1855. Limited to 1,500 coins, each has a reverse showing St Edward’s crown along with a laurel wreath and inscriptions of PERTH MINT, AUSTRALIA and SOVEREIGN. The collector coin is composed of 91.67% pure gold, weighs 7.9881 grams, and has a diameter of 22.60 millimeters. Designed by Natasha Muhl, the emotional word ‘love’ is translated into many different languages and displayed on the 2016 $2 Language of Love 2 oz Silver Proof Coin. The English translation of the word appears in red and includes a heart image for the letter ‘o’. In addition to the language translations, lips, two doves and a cupid can be seen. These coins are struck as legal tender of Tuvalu in a purity of 99.9% silver to a diameter of 50.60 millimeters. Its maximum mintage limit is 3,000. An iconic boab tree native to the Kimberley region is seen on the reverse (tails side) of this high-relief $500 proof gold coin, as designed by artist Tom Vaughan. Included on the reverse is a fine white diamond embedded to represent the rising sun. If the coin looks familiar, it is a mirror image of the sold out 2015-dated pink gold edition. Maximum mintage is capped at 500. Each is struck to proof quality from two ounces of 99.99% pure gold to a diameter of 36.10 millimeters and a thickness of 500 millimeters. 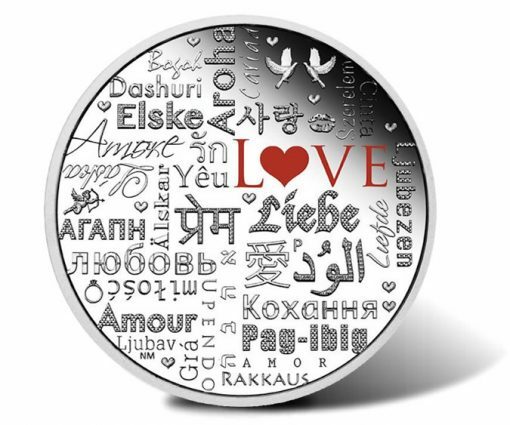 One kilo of 99.9% pure silver is used to produce this latest $30 proof coin. 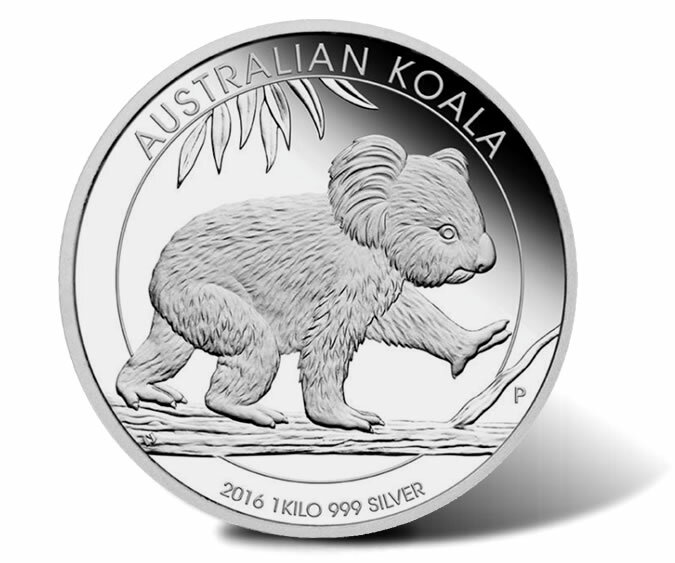 Designed by Ing Ing Jong, seen on its reverse is a single koala as it walks along the branch of a eucalyptus tree. Limited to just 500 coins, it has a diameter of 50.60 millimeters and a thickness of 14.60 millimeters. Coins ship in a classic gray display case within an illustrated shipper and are accompanied by a numbered certificate of authenticity. 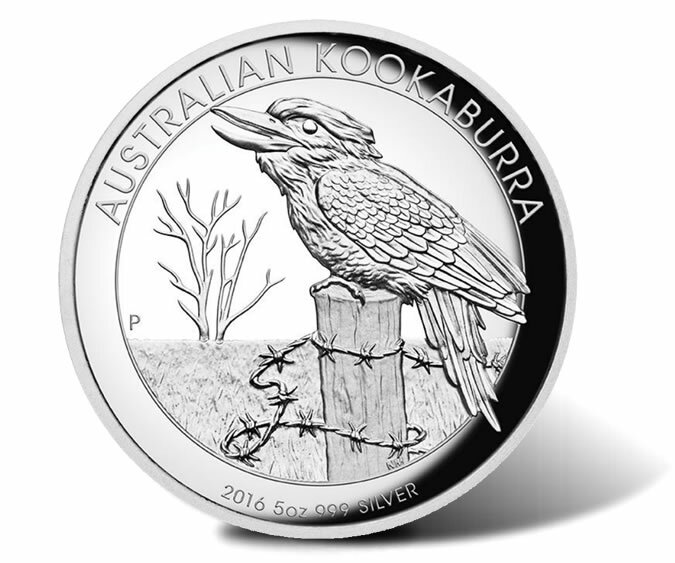 Showcasing the Perth Mint’s original 2016 Australian Kookaburra design by Natasha Muhl, but in high relief, these two proof coins depict the unique bird as it is perched on a fence post. Inscribed above the bird is AUSTRALIAN KOOKABURRA with 2016, 999 SILVER and the weights of either 1 oz or 5 oz below. Maximum mintage for the five ounce coin is limited to 1,000 while the one ounce coin is restricted to 10,000. The bigger $8 coin has a diameter of 50.60 millimeters and a thickness of 12.50 millimeters while the smaller $1 coin has a diameter of 32.60 millimeters and a thickness of 6.00 millimeters. Both include a numbered certificate of authenticity. 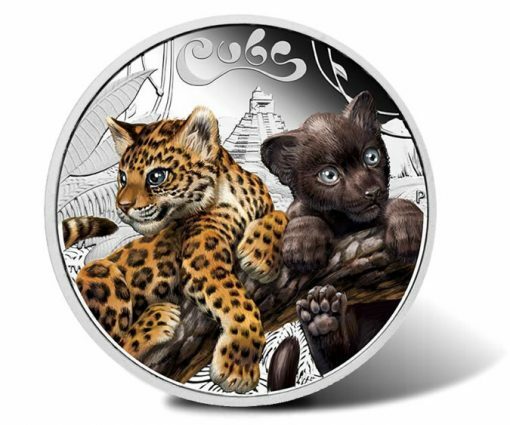 The Perth Mint’s cute "The Cubs" series continues with its second release which depicts Jaguar Cubs in color playing in a jungle, as designed by Tom Vaughan. Behind the pair is an Incan temple. The first program coin offers a reverse design of tiger cubs. Mintage of the proof coin is set at 5,000. These 50c coins are struck as legal tender of Tuvalu in a purity of 99.9% silver to a diameter of 32.60 millimeters and a thickness of 3.10 millimeters. Each ships in a special Jaguar Cubs illustrated shipper along with a classic Perth Mint display case and a numbered certificate of authenticity. 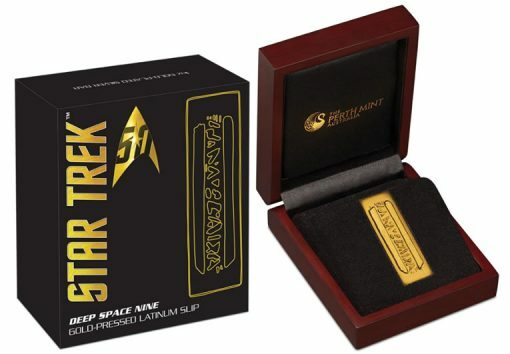 Continuing the Perth Mint’s Star Trek related products, this officially licensed collectible is struck from one ounce of 99.9% pure silver with gold plating to resemble a slip of gold-pressed latinum as seen in Star Trek: Deep Space Nine. No more than 5,000 of these will be issued. Each is presented in a special wooden case, with an illustrated shipper and numbered Certificate of Authenticity. Star Trek characters and starships are also featured in two new Stamp & Coin Covers. One features the character of Spock with the other showcasing the U.S.S. Enterprise NCC-1701. We’ll offer more information of the two covers at a later time. 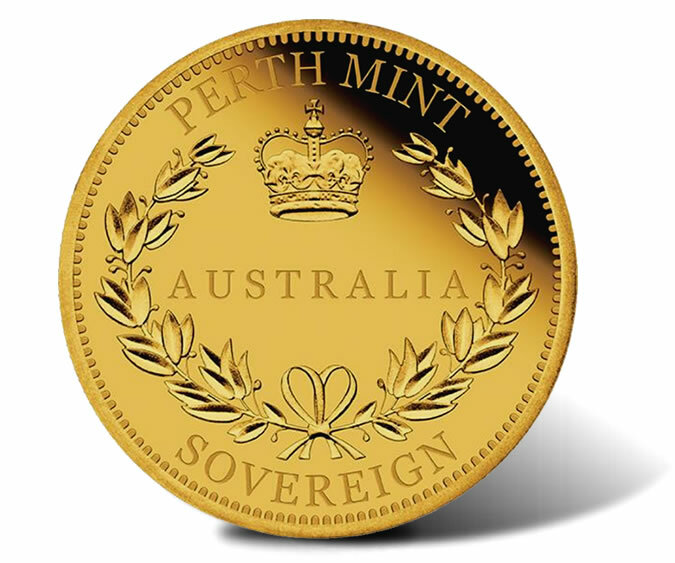 Additional information on these and all Perth Mint products may be found on the Perth Mint’s website of www.perthmint.com.au. Follow our affiliate link to see the Mint’s new releases. Hopefully this article will be updated to comply with international laws & treaties on trademark infringement. This lack of appropriate trademark symbols in this article is simply unprofessional IMHO. Thanks!